My love for chutney developed quite late, almost nine years ago while I lived in England for a couple months. One night I found out about the glorious combination of Yorkshire Wensleydale cheese and chutney. 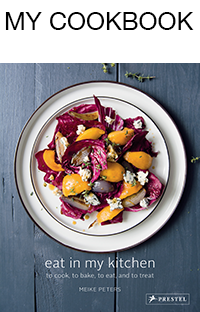 I knew about a similar duo, ripe cheese and fig mustard, a great alternative to a sweet dessert, heavenly when the cheese’s milkiness unites with the spicy and fruity flavours in your mouth! When my dear friend Audrey, a lady who likes good cheese as much as I do, offered me this North Yorkshire delicacy I was taken after the first bite. My favourite was a young cheese, mildly flavoured with cranberries, a bit crumbly and just perfect together with sweet onion chutney. Sometimes, after we had been out, we used to chat in Audrey’s kitchen, get out some jars of pickles, chutneys and a truckle of Wensleydale and we quite often ate more than just a midnight snack! Not too long after this culinary discovery I started to make my own chutneys. 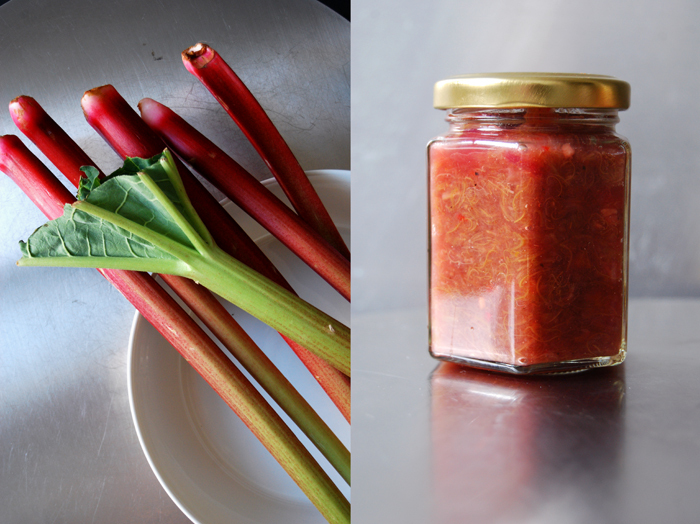 I experimented for a while and came up with a recipe which I now use for all kinds of chutneys, plums, apples, onions or rhubarb. Depending on the fruit’s taste I adjust the spices a little bit but the basic recipe remains untouched. Most of the time I mix in red onions and red hot chili peppers for the spiciness, a couple apples to thicken the texture and lots of spices, turmeric, cloves, star anise, fennel seeds, black pepper, garlic and ginger. 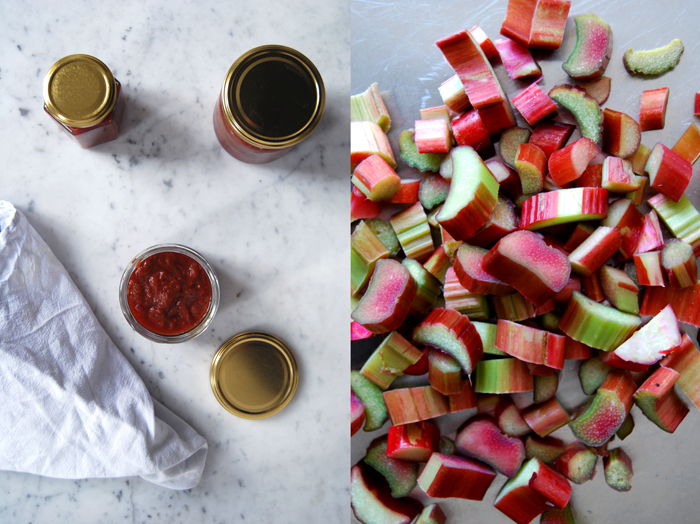 Rhubarb is at its seasonal peak at the moment, the best time to turn it into a sweet and spicy chutney! 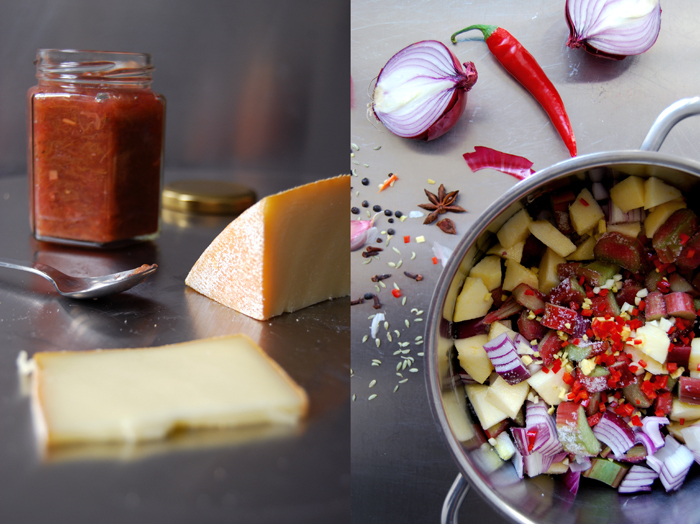 Cheese and chutney isn’t the only way to enjoy chutney, you can also use it to flavour aromatic gravies, eat it with slices of warm or cold roast meat or spread it on sandwiches. In a large pot, bring all the ingredients together with 1 1/2 teaspoons of the spice mixture to the boil. Cook for about an hour on medium temperature until the chutney thickens. You can add more of the spice mixture if you like before you fill the chutney into the jars. Dip the rim of your jars in spirit and wash out the lids with the alcohol as well. Fill your jars with the chutney and close well immediately. You can eat the chutney right away but I prefer to let it sit for 3 weeks. You should keep an open jar in the fridge (mine stays fresh for months) and the closed jars in your pantry. 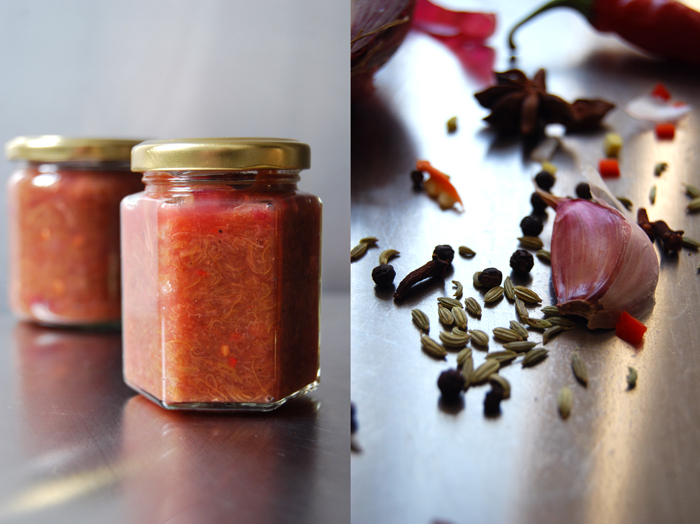 Love your recipe and just about to make it ,have you tried green(unripe) tomato chutney? Goes well with anything as above. That sounds delicious Claudia! I can imagine that the combination of the sweet raisins and red onions is divine, I’ll try that one day! Made it and loved it! Didn’t have any fennel seeds or star anise in house, and added less sugar, but it was still very tasty. Excellent gift as well :). Thanks for the recipe!